This was a Disney miniseries western . 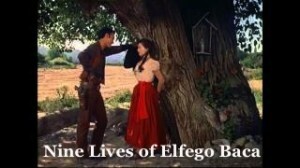 Is a 1958 Walt Disney television western miniseries titled The Nine Lives of Elfego Baca starring Robert Loggia in the title role. Walt Disney took care to depict the famous gun battle siege in as authentic a manner as possible, given the known details. Also starring in the series Skip Homeier, Raymond Bailey, James Drury and I. Stanford Jolley. Episodes of the series were later edited into a movie titled Elfego Baca – Six Gun Law and was released in 1962. Classic western TV series episode shows to watch free. Wild West Toys American made toys. Sponsors this site and rounds up western movies and TV shows from all over the web for you to watch here for FREE . Classic western TV series episode shows to watch free. Complete with Cowboy boots, saddles, cowboy hats, Colt 45 smoke, Old West Towns, fast horses, Wells Fargo offices, Stagecoach stations, runaway wagons, outlaws, bandits, Sheriffs, Marshals, Fancy belt holster rigs, guitars, Cowgirls, singers, Levis, campfires, chuckwagons, cattle drives, wagon trains, cactus, Rustlers, Good Guys, Bad Guys, Ranches, Chase scenes, Deserts, Mountains, Forests and everything else great television westerns always kept us entertained with when we were kids growing up and needed good solid Heroes . Lawman or Gunman western movie site. This part 3 of 10 of this free western the original air date was November 28 of 1958 . Robert Loggia, James Dunn, Ramon Novarro, Skip Homeier, Carl Benton Reid. Elfego Baca must decide is a lawman or just simply a gunman? Friendly Enemies at Law from all over the web for you to watch here for FREE . episode 9 of Disneys wonderful western series. from March 1960. Robert Loggia, Barton MacLane, Pat Crowley, Robert Lowery, John Kerr, Guinn ‘Big Boy’ Williams, Ray Teal and Roy Barcroft. Practicing law can also be dangerous!